Taib (third right), flanked by Awang Tengah on his right and Jabu, shows the memento that he received from Aloysius (second left), as (from right) Harden and Safri look on. KUCHING: Head of State Tun Pehin Sri Abdul Taib Mahmud proposed that a permanent committee be formed to organise the annual Sarawak Regatta. Speaking at the launch of the ‘Heritage Trails and Tales of Unity Project’ by Yayasan Perpaduan Sarawak (YPS) here yesterday, Taib also proposed for former deputy chief minister Datuk Patinggi Tan Sri Alfred Jabu to lead the committee and find ways to strengthen the image of the regatta, and add value beyond sports and culture. “The regatta is a unique feature for Sarawak as we have so many rivers and boats. If we do not continue organizing the regatta, the boats and rowers will disappear,” he said, recommending that this committee be set up next year for the event’s official 30th anniversary. 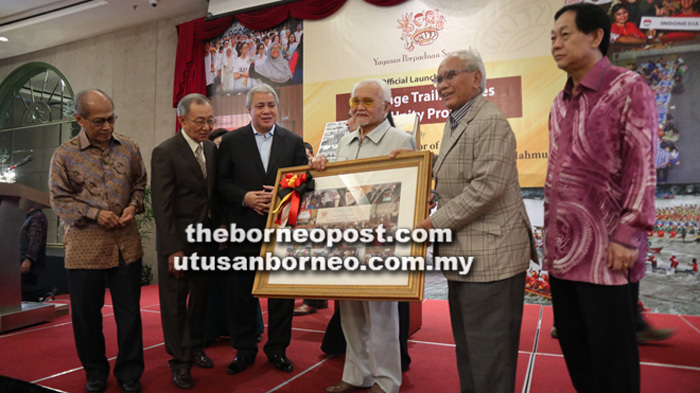 Taib who is also YPS Board of Trustees chairman added that the Sarawak Regatta with history dating back to the colonial era is part of the state’s identity and should be promoted globally. “With that kind of background, it is worthwhile to keep the regatta as a permanent event for Sarawak,” he added. A permanent committee, he said, will enable organisers to plan ahead by at least three years and make recommendations to Sarawak government on how to further develop the event and include features that complement or promote other cultures or sports, particularly tourism for the host town or cities. “At this stage, I have great faith that the regatta can fulfil this role,” said Taib adding that the Sarawak Regatta can also be held in other states to gain stronger interests among participants and revellers. Also speaking was Yayasan Perpaduan Sarawak chief executive Datu Aloysius Dris who said that the Heritage Trails and Tales of Unity Project to explore, discover, document and highlight stories of how people from all walks of life in Sarawak are strengthening and preserving the spirit of unity for posterity. “The core of this project will be the research, compilation, content creation and production of authoritative information material on events, people and places that make up the milestones, landmarks and icons of unity in Sarawak,” said Aloysius. He further said that the main activities planned under this project for 2018 and 2019 would include the documentation of stories on unity and creation of content in the form of booklets and videos as well as online content. At the same function, YPS presented ‘CommUnity Inspirations’ recognition to the Federation of Orang Ulu Associations Sarawak Malaysia (Forum), Dayak Bidayuh National Association (DBNA), Dayak Cultural Foundation (DCF), Amanah Khairat Yayasan Budaya Melayu Sarawak, Federation of Melanau Associations of Sarawak, Federation of Chinese Associations Sarawak, and Sarawak Indian Society. For their collaboration in organising ‘Harmony Walk’ project, YPS presented the ‘CommUnity Inspirations’ recognition to Association of Churches in Sarawak, Sarawak Islamic Information Centre, Kuching Buddhist Society, Malaysia Hindu Sangam Sarawak State Council, Sarawak Sikh Temple Association, and Spiritual Assembly of the Bahá’ís of Sarawak. The ‘CommUnity Inspirations’ recognition were also presented to Masjid An Naim and Good Shepherd Church in Miri, for their inspiring examples of mutual care and respect among their respective congregations. Meanwhile, YPS is a non-profit organisation with the goal of undertaking, promoting, advancing and pursuing any programme, project or activity that preserves, enhances and strengthens unity, harmony and peaceful coexistence of the various multi-racial and multi-ethnic communities in Sarawak and within the Federation of Malaysia. It aims to engage youths of Sarawak in activities that enhance their understanding and appreciation of each other’s cultural heritage, as well as value the hard work and sacrifices of elders to ensure they enjoy unity, harmony and peace. Among those present were Taib’s wife Toh Puan Datuk Patinggi Raghad Kurdi Taib, Deputy Chief Minister Datuk Amar Awang Tengah Ali Hasan who represented the Chief Minister Datuk Patinggi Abang Johari Tun Openg, Assistant Minister for Community Wellbeing Datuk Francis Harden Hollis and former deputy chief minister Datuk Patinggi Tan Sri Alfred Jabu who is also Yayasan Perpaduan Sarawak deputy chairman as well as former deputy state secretary Tan Sri Safri Awang Zaidell.